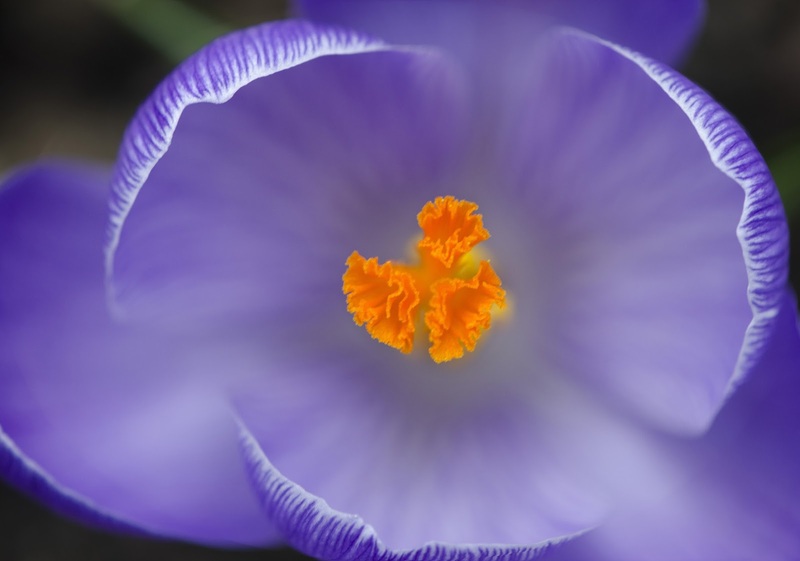 Saffron is the dried stigmas of the crocus flower, and it takes more than one hundred thousand flowers to produce one pound of saffron by hand. It is an extremely labor-intensive crop. That's why saffron is the world's most expensive spice, and also why so there are so many fakes on the market. Each flower has only three stigmas, and these are attached at the bottom of the flower with a pale thread that is called a style. 15) Which country has the best saffron? Saffron has been cultivated in India for centuries, and India is one of the major producers today, along with Spain and Iran. Spain is also a major producer, but some people accused the country of re-branding Iranian produce. Saffron pickers in Masshad, Iran, the hub of the global industry. The best Spanish saffron, or azafrán, comes from La Mancha, and some believe this is the best in the world, but saffron from Kashmir in India is also very good, as is some of the saffron from Iran. 14) How much saffron should you use? Cooking with saffron. From what I've experienced, only a pinch to 1/2 teaspoon of saffron is necessary for most recipes (and too much can add a bitter taste, so it should always be used sparingly). 13) Can you use saffron powder instead of threads? You can add saffron powder directly to a dish without toasting or pre-soaking. Use half the amount of powdered saffron if your recipe calls for saffron threads. While powdered saffron provides the rich gold color associated with paella and other dishes, there will not be any visible threads in your finished dish. 12) How many teaspoons is 1 gram of saffron? Saffron contains 450-500 saffron stigmas to the gram. The stigmas are also called threads, strings, pieces or strands. 1 gram equals 2 tsp. whole, 1 teaspoon crumbled or 1/2 teaspoon powdered. 11) Can you eat raw saffron? This is not a spice one would eat raw. Raw saffron does not have a pleasant taste. One teaspoon of saffron thread (about 0.5 grams) will dissolve in a few tablespoons of hot water in about 30 minutes. Raw saffron has a distinctive musky, woody fragrance and a pungent, bitter taste. 10) How long does Saffron last for? What is the shelf life of saffron? Like any spice, saffron is best when fresh and loses its potency over time. As long as it's kept in an airtight container that doesn't allow any light in, in an environment that has a relatively consistent temperature, it will last indefinitely. I bought a bottle of saffron (about 20 dollars worth) about 5 years ago and it's still fresh and potent (have about a 1/3 of it left). 9) What foods go well with saffron? Saffron uses in cooking. Saffron’s color is water-soluble, and it adds a beautiful yellow tone as well as its flavor to a wide variety of dishes. Spain’s paella is one of the most notable of these, along with Italy’s risotto alla Milanese and France’s bouillabaisse, the traditional seafood stew; it also flavors zarzuela, the Spanish version of that classic. Saffron also pairs well with flavors such as apples, almonds, cardamom, honey, poultry (particularly heritage chickens and squab), bone marrow, milk or cream (try it in ice cream! ), cinnamon, lamb, seafood, garlic, white wine, vinegar, rose water, and citrus fruits. In England, the spice was cultivated in Essex in the Middle Ages, and it is still used in Britain to make traditional saffron cakes. Chartreuse and some other liqueurs are flavored with saffron. It is also used in a traditional Persian stew called koresh and a rice dish called polow. In India, saffron seasons rice and chicken, as well as rich Moghul-style preparations and it flavors sweet custards and yogurt drinks or desserts. Related Post: What's NEW in Oprah Winfrey's Favorite Indian Food Recipe? 8) Where is saffron grown in the world? Saffron crocus cultivation has long centered on a broad belt of Eurasia bounded by the Mediterranean Sea in the southwest to India and China in the northeast. The major producers of antiquity—Iran, Spain, India, and Greece—continue to dominate the world trade. 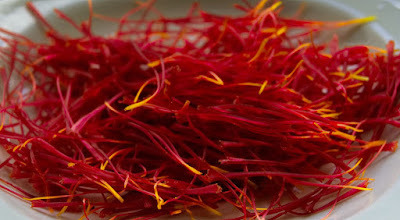 7) Is there a difference between saffron and Spanish saffron? Less-expensive saffron powder is often made from sub-par saffron or old saffron. The best Spanish saffron, or azafrán, comes from La Mancha, and some believe this is the best in the world, but saffron from India and Iran is also very good. 6) What are the health benefits of saffron? What is the use of saffron? Medical Uses of Saffron: Saffron is traditionally prescribed for digestive and urinary tract disorders, coughs, whooping cough (pertussis), asthma and to loosen phlegm (as an expectorant). The active components in saffron also have many therapeutic applications in many traditional medicines as antiseptic, antidepressant, antioxidant, and anti-convulsant. This dried spice is an excellent source of minerals like copper, potassium, calcium, manganese, iron, selenium, zinc and magnesium. 5) Is Saffron good for your eyesight? Saffron for Macular Degeneration: Super Spice for Eye Health. There is a lot of buzz around saffron and its ability to support optimal eye health. The benefits of saffron for the eyes are the result of high concentrations of natural carotenoids that can help protect the lens and the retina of aging eyes. 4) Why saffron is so expensive? Saffron is one of the most precious spices in the world, retailing for more than $500 an ounce. It is so expensive because it is an extremely labor-intensive crop. Harvesting saffron is a demanding, painstaking process. The harvest is in the fall, and the flowers are picked early in the morning, to avoid the heat of the sun. Then the stigmas are removed by hand, traditionally by all the women, young and old, of the town. Still attached to the style, the stigmas are then dried, often still over charcoal or in the sun, the traditional methods. 3) Is saffron worth more than gold? It is the priciest and sought after spice in the world, commonly known as red gold. At some point it cost $65 per gram for the highest quality crop. Saffron can cost even more than gold. 2) What is the substitute for saffron threads? What can be used in place of saffron? Saffron has a very unique flavor and aroma that's tough to replicate. Some would even argue that there is no substitute for this spice. Some people may opt for using a smaller amount of turmeric, which can come close to mimicking saffron in color, but it's not a direct substitute in terms of taste. Turmeric (Curcuma longa), also known as Indian saffron, is an honest substitute for saffron, but it is a member of the ginger family. Use turmeric sparingly as a saffron substitute since its acrid flavor can easily overwhelm the food. Turmeric is also used to stretch powdered saffron by unscrupulous retailers. 1) What is saffron side effects? Saffron is POSSIBLY SAFE for most people when taken by mouth as a medicine for up to 6 weeks. Some possible side effects include dry mouth, anxiety, dizziness, drowsiness, nausea, change in appetite, and headache. Allergic reactions can occur in some people. Taking large amounts (one pound) of saffron by mouth is POSSIBLY UNSAFE.